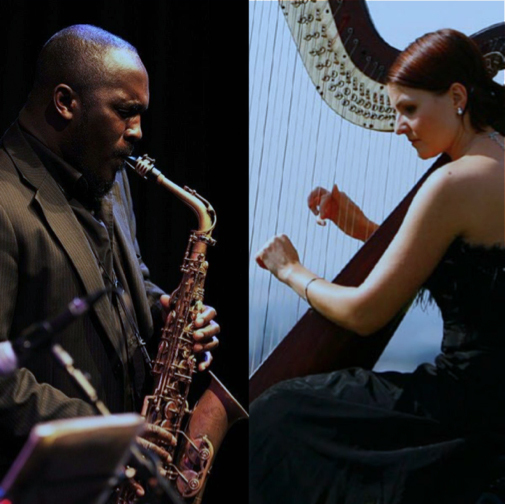 Award-winning jazz saxophonist Tony Kofi and internationally renowned harpist, Alina Bzhezhinska, star in this highly anticipated new show, The Bad and The Beautiful. Together they showcase their musical skills through the art of beautiful melodies and jazz harmonies, within a truly intimate performance. The show features the timeless tunes of Duke Ellington and Billy Strayhorn; scores from ‘film noire’ classics such as “Chinatown” and “The Bad and the Beautiful” and a host of original compositions written especially for this this unique duo. Having ‘cut his teeth’ in the “Jazz Warriors” of the early 90’s, award-winning saxophonist Tony Kofi has gone on to establish himself as a musician, teacher and composer of some authority. As well as for “Nu-Troop” and “Jazz Jamaica”, Tony’s alto playing has also been a feature of many bands and artists he has worked with include “US-3” World Saxophone Quartet, Courtney Pine, Donald Byrd, Eddie Henderson, The David Murray Big Band and Sam Rivers, Andrew hill and Ornette Coleman. His fluent and fiery hard-bop alto playing is constantly in demand. She has performed with many major European orchestras including the National Opera in Warsaw and Scottish Opera. Alina’s London appearances include Shakespeare’s Globe Theatre, BBC Radio 3, the London Jazz Festival and London Film Festival. Alina’s critically acclaimed solo album “Harp Recital” is believed to be the first pedal harp CD made in Scotland. Last year she performed at Glasgow Jazz Festivals, Edinburgh Fringe Festival and the 12th World Harp Congress in Sydney, Australia. “Bzhezhinska played with conviction,…a strong sense of rhythm and superb use of dynamics”.